The finished plate of food. Sweet potato pie will come later. I like to make nontraditional food for Thanksgiving. 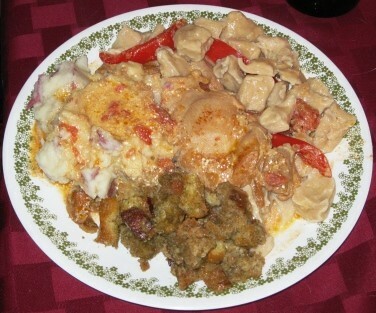 This year, I opted to make Chicken Paprikash (csirke paprikas) and soft dumplings (galuska). And for tradition’s sake, I also made mashed potatoes and stuffing. We paired our dinner with one of the few Hungarian wines available in the U.S.: Bull’s Blood. 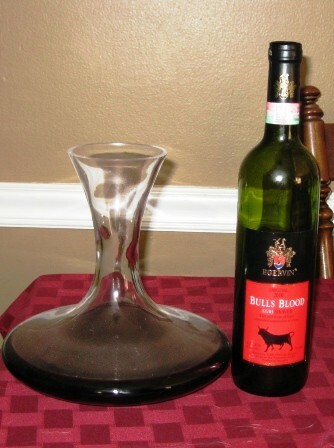 Bull’s Blood is a wine that definitely benefits from decanting. I fell in love with Hungarian food while visiting the country in the late 1990s. I came home and searched for a Hungarian cookbook. I found The Hungarian Cookbook by Susan Derecskey. 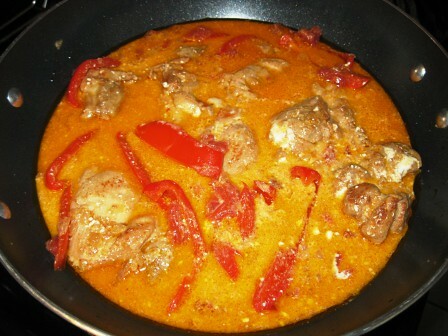 Here’s my slightly adapted version for Chicken Paprikash. Measure out sour cream and put it in a small bowl so it can begin to warm up. 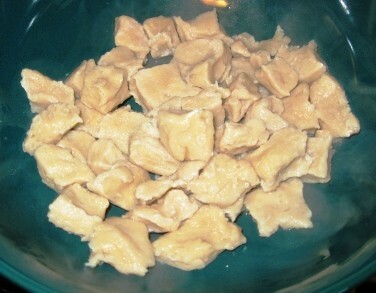 Wash and dry each piece of chicken and set aside. In large, deep skillet, heat olive oil over medium-high heat. Add onion and saute until translucent. Lightly saute each piece of chicken so that it has a slightly yellowed color on each side. Set aside. Add 1/4 c. chicken stock and use it to pull up any bits that may be stuck to the pan (of course, if you use teflon-coated, you won’t have anything to scrape up). Then stir in salt and paprika. Lay chicken as flat as possible in as close to a single layer as you can. Add chicken stock if needed to cover chicken halfway. Lay peppers and tomato on top of chicken. Cover. Simmer 15 min. Turn the chicken and simmer for another 15 minutes. Take about two tablespoons of the cooking liquid and stir it into the sour cream, then fold the sour cream mixture into the frying pan. This is best served over soft dumplings or spaetzle.